Quick review: The internet isn't “ours” versus ISIS. 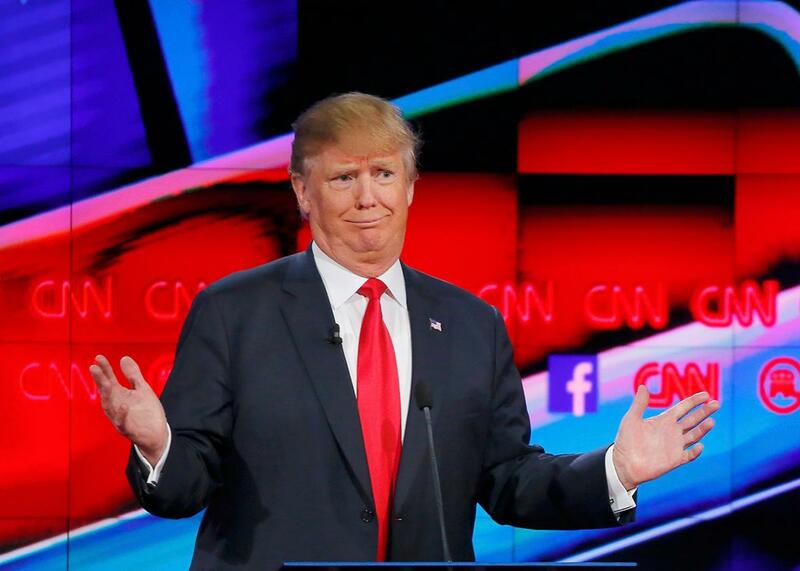 Republican presidential candidate Donald Trump during the debate on Dec. 15, 2015. During Tuesday evening’s Republican presidential debate, moderator Wolf Blitzer asked Donald Trump about his comments that the United States should cut the Islamic State off from the Internet as a way to fight and weaken the extremist militant group. “You recently suggested closing that Internet up,” Blitzer said. “Are you referring to closing down actual portions of the Internet?” As a matter of fact, he is! “ISIS is recruiting through the Internet. ISIS is using the Internet better than we are using the Internet, and it was our idea. … I don’t want them using our Internet,” Trump said. OK, couple of things here. First of all, it’s a bizarre and irrelevant characterization to say that ISIS is using the Internet “better” than the United States. The group seems to use digital services to coordinate, keep in touch, share information—pretty much the usual for anyone with Internet access. Second of all, though the Internet was invented in the United States, it is not owned or operated by any one country, and the U.S. has been working to solidify this multistakeholder governance by transitioning out of its previous role in dispensing domain names. He might like it better, but it doesn’t make any sense. The idea that U.S. intelligence agencies aren’t already doing extensive digital surveillance on ISIS is just silly. The candidates seem to be confused about the encryption debate (over whether governments should have backdoor access into encrypted data). Though there are limitations on how much data international spy agencies can access if ISIS members (or people in general) are careful about anonymity and using encryption, the agencies can still identify ISIS networks and access lots of unencrypted or weakly encrypted communication. And beyond that, if the U.S. did cut ISIS off from the Internet or create a so-called splinternet in which certain regions are ousted from a main network, ISIS would be forced to begin using digital communication in ways that could be even harder to surveil. When asked whether he thinks “shutting down any part of the Internet [is] a good idea,” Ohio Gov. John Kasich said, “No. I don’t think it is.” So that’s something. *Correction, Dec. 15, 2015: This post originally misattributed comments to Sen. Rand Paul that were made by Donald Trump.